The primary focus of the York County Area Agency on Aging is provide education, advocacy, and coordination of community based services to empower older adults to maximize their independence and quality of life. 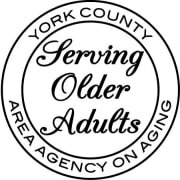 The York County Area Agency on Aging was established in May of 1975 to plan, coordinate, and provide services to York County residents who are age 60 and over. The Agency's purpose is to offer appropriate, supportive services to enable York County's aging population to maintain their independence in their home as long as possible. Would you recommend York County Area Agency on Aging?